The first trips I took without my daughter, starting when she was 18 months old, mirrored scenes out of a bad TV drama: We suffered prolonged teary departures with multiple goodbyes, held disastrous video calls that left my daughter wound up and weepy, and me full of guilt; and discovered that announcing a trip too far in advance made an independent little girl become clingy. We also realized that airport drop-offs can be the worst. Four years and a second child later, we have learned how to make those goodbyes go a lot smoother and come up with tactics for making Mom or Dad’s time away from home more bearable, and even fun. Preparing your child for your travels depends a lot on his or her age, personality, and temperament, and your family situation. Every child and every family is different, but here are some ideas to consider the next time you prepare for a child-free trip, and once you’re underway. How far in advance you mention the trip depends on how long your trip will be, your child’s age and current emotional state, and whether or not other stressors exist. To minimize stress, pick a time when they aren’t tired, upset, or frustrated. My kids, now 3 and 5, still don’t fully understand the concept of time, so I don’t go into too many details about how many days until I leave or how many days I’ll be gone. If I’m going on a trip that’s a week or longer, I’ll let them know about a week before I go, and then casually mention it here and there so the idea sinks in and becomes familiar. For shorter trips, I wait until about two days before I leave, and then I hype up all the things they’ll get to do while I’m away. That takes the focus off what will be missing: Mom. Kids are more involved than ever in planning family vacations, according to a recently released global survey. Older kids often benefit from more advanced notice because it lets them get used to the idea and plan. Follow your child’s lead, and share as much or as little information about the trip as needed. Your child may want to know all about your destination — where it’s located on a map, where you will sleep, and what you will do while there — or may simply want to know how many times he or she will go to sleep until you get home. Parents travel for many reasons, and while it can be challenging, a little parent-child separation can also be healthy. I travel without my children for up to several weeks a year, which gives my husband and kids special time together, and helps the kids gain more independence in their typically mom-centric world. I also want them to see that there are things I am passionate about — seeing and experiencing the world, and meeting people from other cultures — but that I will always come back. We have learned the hard way that it’s best to keep the goodbyes short and sweet. Dragging it out, or spending too much time reassuring kids that you will come home, is not productive. We do put thought into where we say our goodbyes. It goes a lot smoother if the kids are immersed in an art project, out riding their bikes, or heading over to a neighbor’s house for a play date, rather than watching Mom or Dad go through the airport security gate into a passenger-only zone. Nor should you ever just slip out the door without saying goodbye. 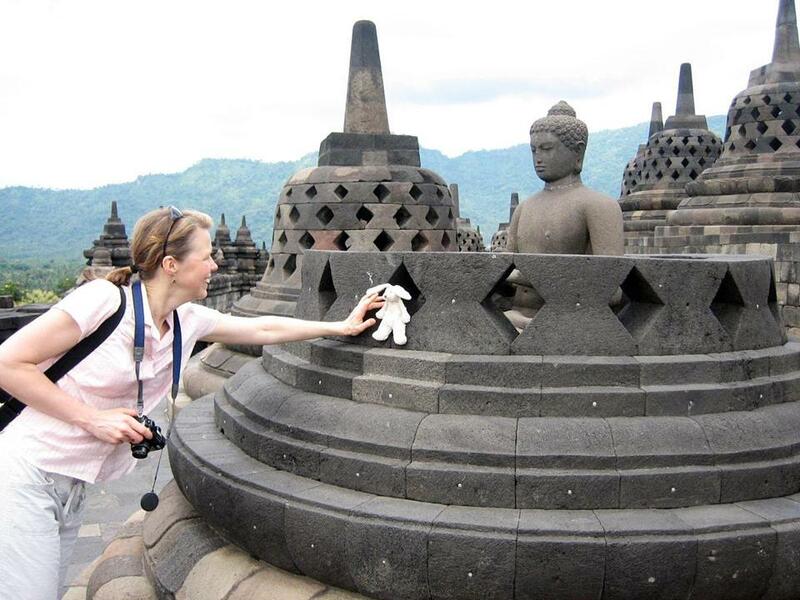 Laurel Watjen took her daughter’s stuffed bunny to Indonesia with her and sent her daughter, 4, photos of the bunny’s adventures. 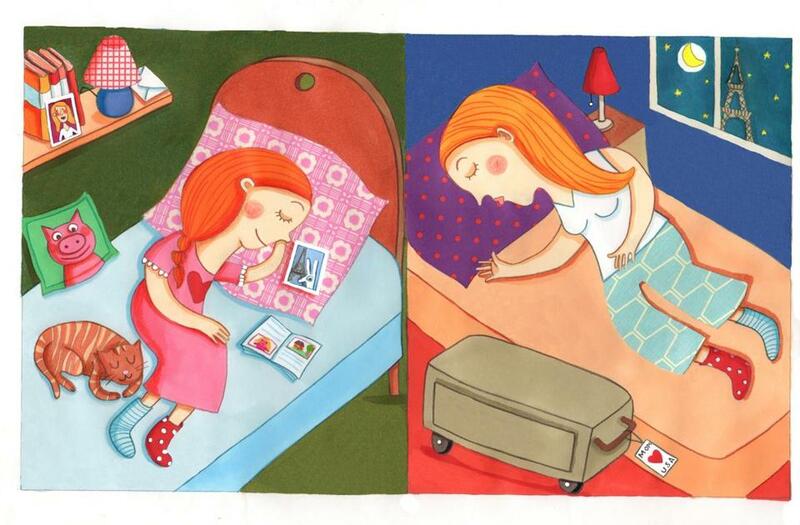 Some parents leave little gifts or notes behind for their children to find, or record themselves reading a bedtime story. Others will give their kids a special object for them to hold onto or, for infants and younger kids, a piece of clothing that smells like mom or dad. One mother I know writes soap notes on the bathroom mirror to be discovered later when the shower fogs it up. “Before I went to China for a month, I taped 30 envelopes on my son Jacob’s wall, each one labeled with a date, and put a different note or quote or treat in them,” says Deborah Grayson Riegel of New York, whose twins were 9 at the time. “He could only open one a day, and really looked forward to waking up and doing just that. Laurel Watjen traveled to Indonesia for two weeks when her daughter Izzy was 4, their first long separation from each other. Give kids plenty of comfort and support while one parent travels, and the reassurance that life will march on as usual. That doesn’t mean you can’t add play dates and special outings to make the time you’re away more fun for your children, but it helps to maintain the usual overall routine, so the days remain as familiar and predictable as possible. In today’s uber-connected world, it’s easy to stay in touch by phone, e-mail, and video calls, but you need to figure out what works best for your kids and your travel schedule. Time differences, flight delays, work commitments, and other travel factors can make connecting at the right time a trick. Don’t promise to call if there’s any chance it won’t happen, and feelings may be hurt. Video calls can work great for some children. For others, they can be a definite setback. Sometimes, it just depends on the day and your child’s temperament. I had wonderful Skype interactions with my daughter when she was just 2½ years old, and failed conversations when she was 5 that left her teary and unable to sleep. My husband and I quickly learned that conversations within an hour of bedtime rarely end well. Grayson Riegel’s twins, now 14, have fairly opposite needs. With some sensitivity and creativity, and perhaps a little trial and error, you can figure out how to prepare your child for your travels and the best way to feel close when you’re far away. That way, your goodbyes and trips will go smoothly, and you can avoid some of the bad TV drama scenes my family has reenacted.